In android, you can control playback of video, audio and streams in many ways. Previously I have already posted some tutorials about android XML UI design like bar chart XML UI design, simple calculator app XML UI design, material design profile screen, sign up/registration, login and contact form, etc. In this tutorial, you will learn to create android music application XML UI design. 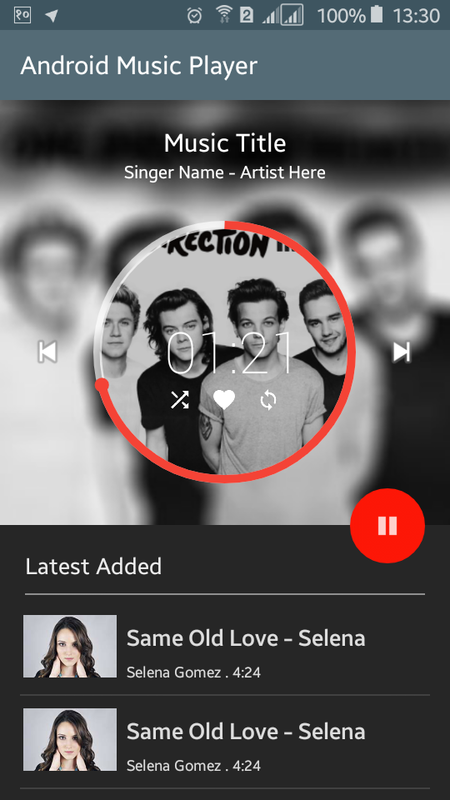 In this music player app XML UI design, you can add further features like playing music with sound, display related music or latest added music, sharing option, etc based on this UI according to your needs. Music progress is shown in circular progress bar and inside circular progressbar there is music progress shown by seconds, favorite button and so on. To play and stop music, you can use android floating action button, here I have used just an ImageView. Let’s start to create a music player android app XML UI design with the project name Music Player XML Design. Open your app colors.xml file (res/values/colors.xml) and add following color values. Again open your app build.gradle file and add compile 'com.github.iammert:InteractivePlayerView:f4f6490290' as dependencies and url https://jitpack.io in maven inside repositories which will look like below. Create a new XML file (circle.xml) inside drawable directory and add following XML code. Following code will make a circle/oval shape with red color as background colour. This circle shape is needed us later in XML layout file. You need to add some icons and images inside drawable folder with following name. You can find these icons and images here. In XML layout file you need to add many Layouts (LinearLayout, RelativeLayout, ScrollView), ImageView, TextView, co.mobiwise.library.InteractivePlayerView, View, etc with different attributes. Following is the complete content of XML layout file. Open your java activity file and extend AppCompactActivity and then implement OnActionClickedListener. You can set start progress from and maximum progress in second like mInteractivePlayerView.setMax, and mInteractivePlayerView.setProgress. Following is the complete code of java activity file. Now, run your Android Music App XML UI Design application which will look like above screenshot. If you click on the play button you will see the music progress in the progress bar. You can download complete example project of android music application XML UI design from GitHub.